Several hundreds garment workers have observed a token hunger strike in front of Bangladeshi National Press Club in Dhaka today demanding payment of workers’ dues, including wages arrears and allowances from five garment factories and legal compensation of retrenched workers of four garment factories. 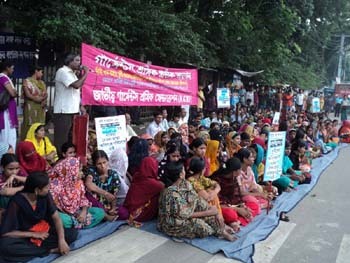 Bangladeshi National Garment Workers Federation (NGWF) organised the hunger strike, which was followed by submission of memorandum to the Ministry of Labour, Government of Bangladesh. Federation President Amirul Haque Amin presided over the hunger strike while Shamyobadi Dal central leader Harun Chowdhury, Coordinator of Bangladesh Garment Workers Unity Council Salauddin Swapan, General Secretary of Bangladesh Garment Trade Union Centre Ruhul Amin and NGWF leaders Ms Safia Parveen, Mohammad Faruk Khan, Mrs Sultana Aktar, Mohammad Kabir and workers’ representatives of the affective factories spoke on the occasion. Dhaka city but the management did not pay wages and allowances of month August till now. 200 workers work in Bristi Garments (Kazi Fashion) of Tikatuli but the management did not fully paid wages and allowances of month of August. 200 workers work in Jas Fashion (Dab Star group) of Arambagh but management did not pay wages and allowances of month of August. 1000 workers work in Reo Fashion (Dab Star Group) of Arambagh but their wages and allowances of month of August still remained unpaid. 350 workers work in Millennium Garments of Tikatuli but management did not pay wages and allowances of month of August and overtime bills of months of July and August. Illegally retrenched workers of the four garment factories are 97 workers of Benson Apparels of Tejgaon. They were retrenched on March 22, 2011, 30 workers of Riz Fashion of Matuail. They were retrenched on December 14, 2010. 25 workers of Aditi Apparels of Mirpur, they were retrenched on December 12, 2010 and 45 workers of Bristi Garments and they were retrenched on Sepetember 7, 2011. The Management of all these factories refrained from paying legal dues and compensations to the retrenched workers. Demanding immediate payment of dues and arrears to the workers of these factories, speakers alleged that the problem was not solved even after submission of grievance petitions and memorandum to the BGMEA. After the hunger strike program, a five-member delegation led by NGWF General Secretary Ms Safia Parveen submitted a memorandum to the Ministry of Labour, urging the government to take effective action immediately.